We ironed 3 shirts, 3 pairs of pants, 3 dresses and one sweater then tamed 6 heads of hair. Shoes were found and we loaded up in the heat to go to Cathedral for a funeral. I felt the void of his absence as sure as if the air was sucked from the room. Through the weekend, in the few still seconds between all the other things we were doing, I felt the emptiness and gulped in the oxygen. It’s true we did not know him well, not much beyond acquaintance really, but as Bishop Gruss said in his homily, “It’s like a rock star has died. But the Rock is the rock of Christ. His love was Christ loving us.” Monsignor O’Connell shone Christ and an encounter – no matter how brief – left you feeling known and loved. So we went to mass, over lunch and naptimes. History lessons were abandoned for life lessons because I want our kids to understand life is a terminal condition and that they have a call and if you’re going to spend your life, it’s best spent for Christ. I listened to Gemma ask Elizabeth if that was his body, felt my throat tighten at the plain pine box draped in a star quilt, and prayed hard for our sons who are listening for their call. The pall was placed and the procession began, our Crucified Lord leading the way. And yet the priests wore white, the symbol of the resurrection and victory. I watched his family, large and healthy spanning several generations and was struck mute. O.C. belonged to Western South Dakota, to the impoverished, the Native, the Hispanic, the priests, the widows, the people. And yet, here were his people, his blood and they loved him ounce for ounce as we did. These priests, they are never lonely and their families expand beyond their reach by the grace of God. O.C. left specific instructions about the homily to be shared. Don’t talk about me, he said, but the love of God in the priesthood. The Bishop admitted to falling short, of struggling to ignore the presence that was the Monsignor. This man, a priest’s priest, did what he did through Christ’s strength and the Lord allowed him to serve 58 years when the doctors optimistically said 10. I was reminded of a conversation I had once with someone who was upset by a Catholic funeral. “They didn’t talk about her at all or let anyone share.” I tried to explain that a funeral isn’t meant for that. A wake? Yes! But a funeral? A funeral is a final send off, a time to pray for the departed, to commend them to God, to come together and, shoulder to shoulder, remind ourselves of the resurrection. In the silence post communion a singular priest began low and loud, “Salve Regina . . . ” The entirety of our presbyterate stood together and joined the song. 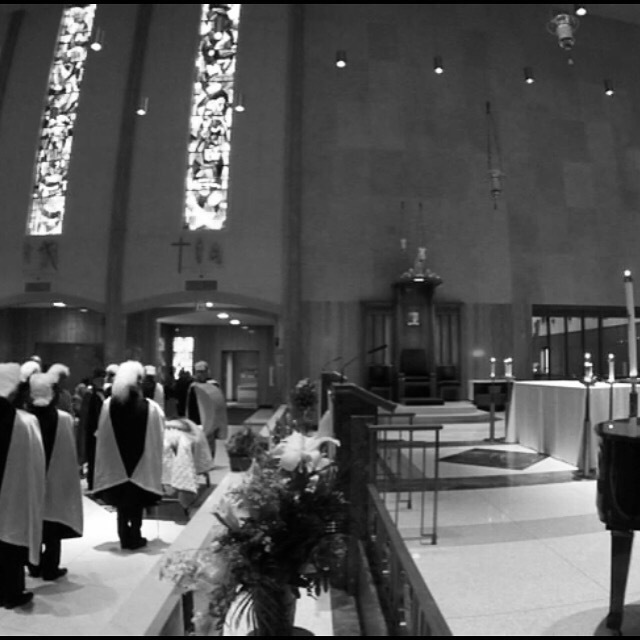 They faced the coffin and us, their masculine voices filling the sanctuary. Our kids, and everyone else, froze, moved by O.C.’s brother’s farewell. There was a second of silence and we stood for our own goodbye. Again, the silence breathed and then, from the choir loft, a lone voice began a Lakota honor song. Three others joined in and soon the drum, too. I wept, holding my breath against sobs. It wasn’t because of the drums – though Lord knows they get me every time! – or because I understand Lakota. I cried, overwhelmed with the ferocity of the love the people of the diocese have for our priests. The song was glorious and fitting for O.C., but it was the spirit, the pure gift of it that conveyed all our hearts. When the mass was over, eyes red and puffy, person after person admitted to being overcome. And really, it was perfect. The song was a mystery to most of us but it moved us in the same way that God’s love and mercy is beyond understanding and yet changes hearts and lives again and again. O.C. lived his life in that truth. . . what a way to end it. You can read O.C.’s obit here and the local news story here. The words in italic were all sung today. Absolutely Beautiful! Oh how we all yearn to live a life well lived, for people to see Christ in us. What an incredible man! Oh Annie…what a beautiful tribute to a life WELL LIVED. Your words made me feel as though I was there, when I couldn’t be…thank you for that.